Synopsis : Mountain Trike Company who manufacture and design custom made all terrain wheelchairs have introduced some new color ranges for 2015. The wheelchair company offer various bespoke elements for customers to choose from and one of the choices is that customers can opt to have their preferred color they would like their Mountain Trike to come in. The Mountain Trike is an all-terrain manual wheelchair which has been designed using a blend of unique innovation control and drive system with high specification mountain bike technology. It provides wheelchair users with far greater freedom and independence than ever before to travel off the beaten track with comparable high level of maneuverability and uneven surface performance, practicality and comfort. "To be able to offer customers a choice of color frame is quite unique and it's surprising how important it is to most of our customers - it's very personal and can really help represent their personality. 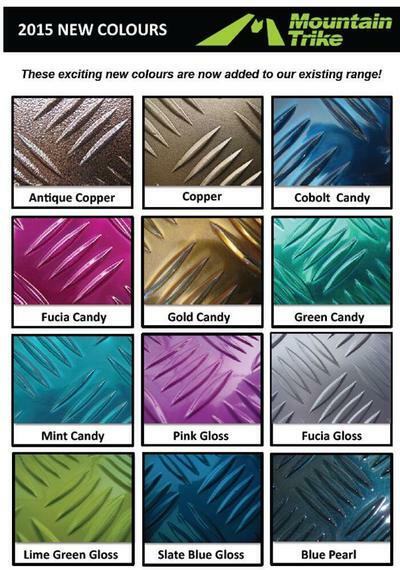 We've produced some incredible colors in the past, such as metallic orange, candy red, metallic gold, raspberry pink, emerald sparkle to name a few and someone even had their favorite football club team colors - it's great to see the final finish of each individual Trike and every unique color always looks so stunning. In order to keep things fresh and to continue to offer customers the opportunity to personalize their Trike to their own style we can now offer some additional bright and exciting alternatives to our existing range." The Mountain Trike Company can also offer a re-paint for existing customers wishing to update and have a refresh in color for their Trike. The company use a powder coat rather than a paint, so the powder coat can be stripped off in an acid bath, sand blasted and then re-powder coated in the new color. There would be a cost for this and as the Trike would need to be fully stripped down there would be labor costs too. The Mountain Trike Company believes in access for everyone and manufactures all-terrain manual wheelchairs. Each chair is designed using a masterful blend of unique innovation and drive system with high specification mountain bike technology. Their wheelchairs provide users with far greater freedom and independence than ever before to travel off the beaten track - trips to the park, woodland trails, mud, snow, sand, cobbles and even mountains! No other manual wheelchair provides comparable high level of maneuverability and uneven surface performance, practicality, comfort and safety. Despite deep mud and wet ground the unique lever drive and steering system means your hands stay clean and dry.